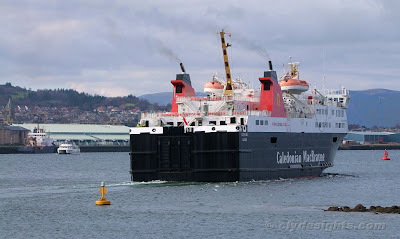 Having completed her annual overhaul, ISLE OF LEWIS left the Garvel yard at lunchtime on Monday, headed out to the Tail of the Bank for brief trials, and then returned north to resume duty on the Stornoway-Ullapool service. During her brief sojourn at Greenock, she was fitted with extensions to her main engine exhaust pipes, presumably in an effort to keep fumes clear of her accommodation fan intakes. Lying at Customhouse Quay is the lighthouse tender POLE STAR, while ALI CAT can also be seen returning to the James Watt Dock after her Monday sailing to the Maersk ships in Loch Striven.